We assembled and regrouped in Kalaw, and for the first time really felt the cold. Kalaw is high up in the Mountains, and we were staying at Mr Robin’s place, a large timber hotel with little chalet type rooms. 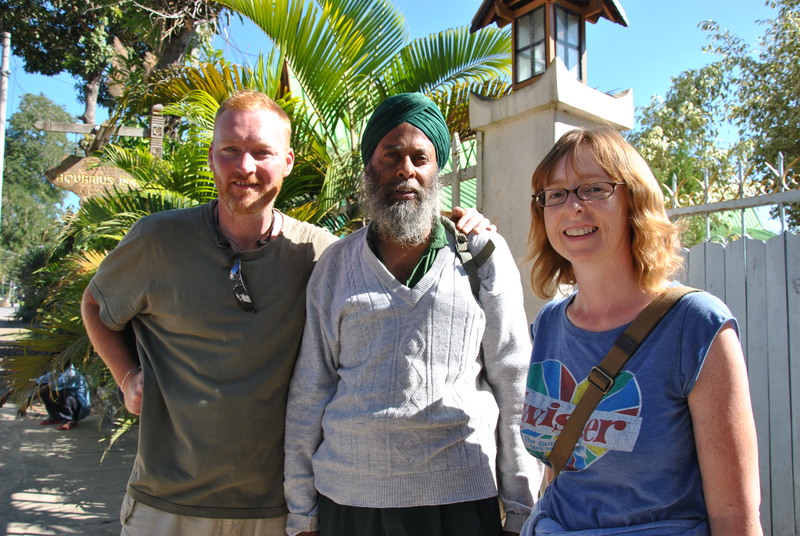 We discussed the trek with Mr Robin, a turbaned grey bearded Sikh in his 60’s who would be our trekking guide. The trek would be 60km in total over 3 days and take us through the central Myanmar Mountains and countryside. We decided to head out next morning, so we had an afternoon to play with. We rented a couple of motorbikes from the locals, and with my biker chick holding on tight behind me, we followed Alexander and Sofie as we headed up the road, gaining height almost immediately as we headed up a mountain road. We spotted a temple on top of the mountain, and luckily there was a dirt track which led directly up. The views were quite stunning and reminded us both of Scotland. We had a look in the temple, only to find a Buddhist monk fast asleep. Next morning, we were joined at 7am by Manu from Belgium, Alexander & Tina, our adopted kids Sofie & Carina, and Taku from Japan. The first day went quite well, although quite arduous, but we walked past tea plantations, chilli farms, and striking mountain scenery. As we walked, Mr Robin would chat away telling us about the history of Myanmar, about the locals of each village and how they live, and showing us various plants and vegetables that were used as natural remedies. 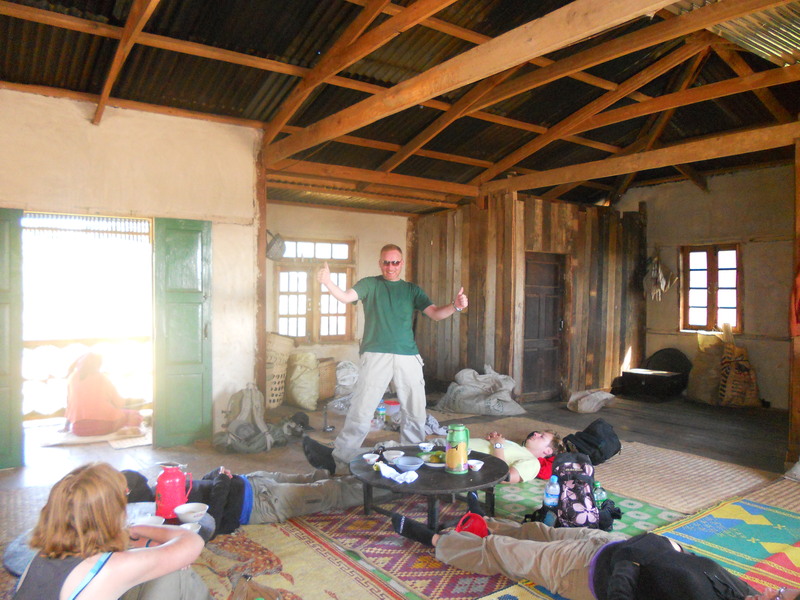 We stopped at lunchtime and were served vegetable curry and chapattis and local tea in a villager’s home. In the afternoon, we were really toiling, most of the walk was uphill and it was with great delight we reached the train station around 4pm to stock up on provisions (cold beer) for the remaining 1 hour walk to another village where we would be staying for the night. A local villager had given up his home, and we were all going to be sleeping in the same room on straw mattresses. Fortunately for “Fadja” and “Mudja”, there was a little annexe to the room, so that became Mum & Dad’s room. I still laugh when I recall Carina asking if she could jump in Mudja and Fadja’s bed if she gets scared during the night. We were served a massive buffet of Burmese Thali curries, and washed this down with the cold beer, which tasted even better after a hard days slog. The next we were up at 5am, and every muscle was aching, but we soon loosened off after about an hour or so. By this stage the “kids” were singing Wham’s “Last Christmas” as we marched wearily up the mountains tracks. Lunchtime was vegetable noodles and soup at a local villager’s house again. Everyone was in pain and heavily blistered. It was a quiet lunch as everyone was exhausted, most of the group bedding down and grabbing a midday snooze for an hour or so before being summoned by Mr Robin for the next leg. That afternoon we were taken to the Medicine Man’s House. This old man was 84 years old and looked like an old apache warrior, with wrinkled brown leather skin, and smoking a bit fat cigar that was hanging from his mouth. He had lost his wife 40 years ago and had never remarried. We were told that he had been a hunter in his youth and had killed 3 tigers single handedly. We were offered various natural remedies to taste, including a very rare honey which was collected annually from a secret place in the mountains. That night we would arrive at a Buddhist Monastery, where we would be fed, watered and bedded down for the night. In the morning we awoke at 5am to the sound of all the monks chanting their prayers, and after breakfast we met the head Monk. We all had to sit down as he blessed us and gave us each a white thread wristband which was supposed to bring us good luck. He advised us not to drink the local whisky as it was very bad for us – too late mate. Besides, we had taken honey from the Medicine Man, and were now invincible. The last day trekking was much easier, and the end could not come quick enough for me. The views leading all the way down to Inle Lake were quite stunning, most of the scenery is, and I have run out of adjectives, but this view was particularly impressive as you could see the whole valley with the lake at the bottom, and a sequence of immense ancient Pagoda’s. When we arrived in the small village by the river, we were given a lunch of chicken noodles before we all boarded a single motorised longboat, each of us sitting one behind the other. The boat sped off down the narrow little river as we passed village after village. We were all putting our hands in the air as the boat hit some rapids, and having great fun as the wind blew past keeping us all cool. That’s when we spotted an old woman smoking a big fat cigar on the porch of the front entrance to her shack. She had an elongated neck through years of having her neck covered in metal neck rings. I could feel a lump in my throat and I could feel tears of happiness welling up. I really got quite emotional, this was simply outstanding and exactly one of the reasons you go travelling. We were in another world quite frankly, I felt completely alive. As we left the river and glided on to the lake, seagulls were flying about a couple of foot above us, escorting us to the town where we would be staying, Nyaungshwe. Nyaungshwe would be the last town before having to head back to Yangon and the flight to Bangkok, Thailand. So we said our goodbyes to Mr Robin, and had a couple of days to relax. I have no idea where the energy was coming from after the trek, but I managed to cycle miles and miles on that last day while Michelle chilled out back the hotel reading a book. Out in the countryside, I just took in the scenery and reflected on the past month. It had gone at lightning speed. 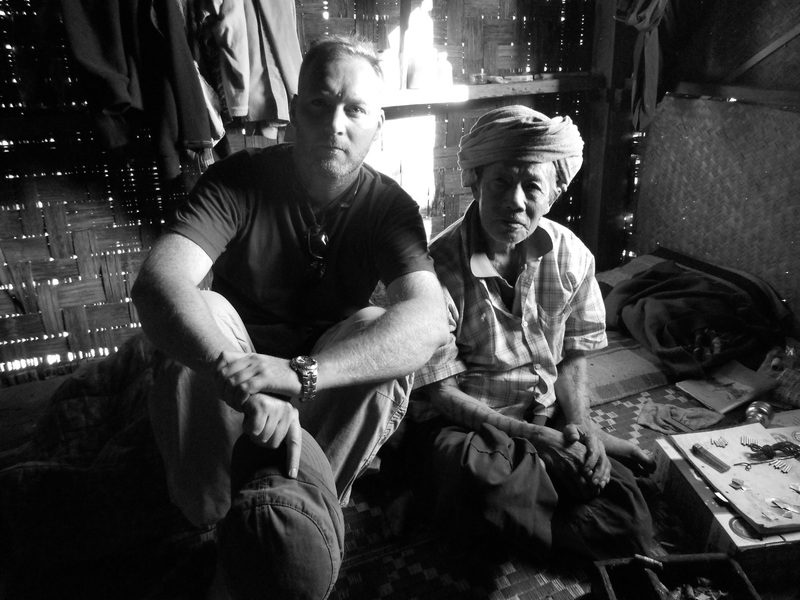 Myanmar is a truly magical place, really special. If there was one place we would return to – it would have to be Myanmar. Cambodia next, and Dad is coming over. We will stop over in Bangkok to recharge/reboot prior to Wee Pete arriving. Has it really been 6 months we have been travelling? It will be great to see Dad, and especially good that we will be doing the temples of Angkor Wat together. It was so nice to meet all of you, top-notch quality time! Manu – nice hear from ya ! What you up to now ? Pete. Well, after Myanmar I went to Koh Phangan Thailand where I had a blast for one month, accident with the motorbike not included ofcourse! Right before X-mas, I drove my way back coming from an afterparty, and due to not paying attention, I suddenly was driving at the right side of the road! A ladyboy came from the other direction: massive crash as a result! My head smashed the concrete, had to go to the hospital: 9 stitches right above my eyebrow, inside the head everything was fine! Broozes and scratches everywhere, and in Thailand’s humid climate, wounds take a very long time to heal! Lots of financial damage as well, the crash lowered my budget very hard! So I had to slow down for two weeks, which in the end was a good thing cuz I was having too much of a ball! I partied at Koh Phangan for over one month, and forgot a bit about travelling until I had to do my visarun to Malaysia, Penang. It was so good to be away of party culture, and lucky me also had the chance to visit the Thaipusam Indian Vegetarian festival over there! Complete insanity! Once in Malaysia I decided not to take a two months visa for Thailand, only a two weeks, and after one week Koh Phangan again I moved to Indonesia via Malaysia! Over there I picked Sumatra to explore, which was a perfect decision: paradise! Went to Lake Toba, Pulau Samosir, and afterwards to Bukit Lawang where I participated in a jungle trekking: oerang oetangs, makaak monkeys, gibbons, monitor lizards, absolutely amazing! I you ever have the chance to do this, do not hesitate! Now I’m back in Melaka, Malaysia. Tomorrow I’m going to Kuala Lumpur to take my flight to Sydney, where I will only stay one day because the day after I have to catch my flight to Lima, Peru, to attend the marriage of my brother! My time is running out: flight back to Belgium on the 2nd of March! Plan is to cash up a bit for my next trip! The last few months in a nutshell! Hope both of you are doing well! Keep up the good writing man, I love it! I will keep in touch, it’s a small world! Manu – you did exactly the same thing we did in Sumatra ! and also Malyasia ! You should scroll through the blog just to see how close our trip was to yours! I hope you tried the Tandoori Chicken at Puk Patra in Melaka ! We stayed in Samosir Cottages on TukTuk – and here is the site I created for the Jungle Guides that we had at Bukit Lawang – wonder if you recognise anyone ha ha !